Bill Fortin served in the United States Army, 3rd Armored Division, from April 1968 to April 1970. Retired from Bell Labs in 2001, he is currently the CEO of IBS, Inc., an international marketing and systems engineering company. He holds a Masters Degree in Management Sciences from the University of Baltimore. A native of Maryland, he is a member of the 3AD Association. 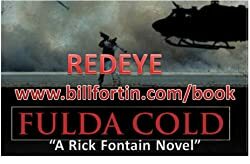 Redeye Fulda Cold by Bill Fortin is a different type of war novel. This piece of history is set in 1969 West Germany. The reality of what happened in the Cold War on the border between the opposing forces of East and West makes this a great read; it's an important part of our military history. Please enter your email address and click the Follow button to follow Bill Fortin!